E-bikes are the hot new thing in the bicycling world. Though they’ll probably never completely replace normal bicycles, they’re certainly a worthwhile investment for those interested in a helpful peddling assist. Short for electric bicycle, E-bikes consist of a modified bicycle frame outfitted with a small, electric motor. You can either pedal like normal or turn the battery-powered motor on for easier going. E-bikes are perfect for commuting, exercising, or just getting around town. They’re highly economical and are available in a wide variety of models. The options are so numerous that narrowing down your choices to one can be difficult. That’s where our E-bike buyer’s guide below comes into the picture. We’ve reviewed the top 12 best E-bikes under 1,000, so you can find the model that best suits your needs and preferences without breaking the bank. Here are our choices for the top 12 best E-bikes for under $1,000 total. The Swagtron SwagCycle E-Bike takes many of the benefits of a full-size electric bicycle and combines them in a pedal-free electric scooter package. The SwagCycle is capable of speeds up to 10mph thanks to its 250-watt motor. It has a 10-mile range on a single charge thanks to its 36V battery (with a charging time of 2.5 hours). Additional features of interest are the handlebar display and the USB charging port that lets you charge your electric devices while you ride. 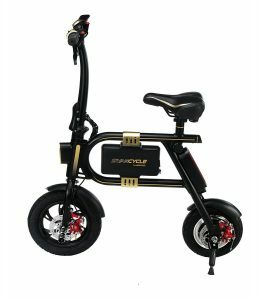 The biggest downside to this E-scooter from SwagCycle is the lack of pedals. You won’t get much exercise with this product, though it is great for short commutes. 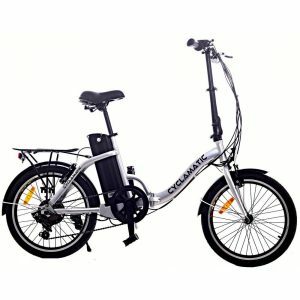 The Swagtron SwagCycle E-Bike is a solid option for those that want a small, durable E-scooter at an affordable price. However, if you want a model you can pedal, you should look elsewhere. The Ancheer Power Plus Electric Mountain Bike combines the best of both worlds: high-performance design and affordability. 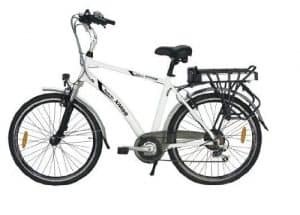 A 100% aluminum alloy frame and carbon steel front fork house the 36V, 8AH ion lithium battery and 250-watt motor capable of speeds up to 25mph. A 26-inch front wheel, front and rear disc brakes, and 21-speed transmission add up to a safe ride. Three levels of pedal assist mean you can pedal yourself, get assistance from the motor, or rely solely on the motor to power you along. Pedal yourself for exercising on your E-bike and switch it into assist mode when you get tired. Though the important components of this E-bike are top-notch, some of the minor components, like the kickstand, break easily. The Ancheer Power Plus Electric Mountain Bike doesn’t exactly stand out from the pack – yet it’s undoubtedly a durable, full-features, high-quality E-bike at a stellar price. Versatility is the name of the game with the Watseka XP Cargo Electric Bicycle. Like the Nakto E-bike above, it utilizes a laid-back cruiser design complete with front cargo basket. The low step-through frame makes getting on and off the bike easy. Though this is beneficial for all users, it’s particularly useful for elderly E-bike users. Other top features include the 250-watt brushless motor powered by a 36V, 9AH battery capable of average speeds of 15mph and a range of 15 to 20 miles. The 6-speed Shimano gear set makes for a seamless riding experience. 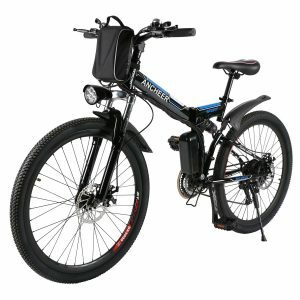 The Watseka XP Cargo Electric Bicycle is one of the best E-bikes available for commuting and running errands. It could be the absolute best if it just wasn’t so heavy and was more waterproof for rainy day riding. The Ancheer Folding Electric Mountain Bike takes the standard Power Plus frame and adds premium full suspension as well as a 21-speed Shimano transmission system into the mix. The removable 36V, 8AH ion lithium battery charges in under 6 hours and provides up to 30 miles of riding time. An ultralight aluminum alloy frame, carbon steel front forks, and front and rear disc brakes are additional features of note. The Shimano transmission system paired with the 26-inch front wheels, anti-slip thick tire, and electric assist mode allows this E-bike to conquer off-road trails with ease. The biggest downside to this electric bicycle from Ancheer is its weight. At around 60 pounds, it’s quite heavy. And this weight is noticeable when pedaling. 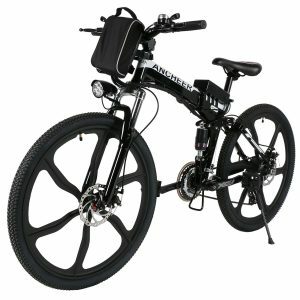 The Ancheer Folding Electric Mountain Bike with Premium Full Suspension is a great choice for those that want an E-bike that’s just as capable on off the road as it is on the road. Like all Ancheer E-bikes, this model is made with top-of-the-line materials. What sets it apart is not only its Shimano transmission system and premium full suspension but also its unique 6-spoke wheels. These 26-inch magnesium alloy wheels are incredibly strong and lightweight. Combined with anti-slip thick tires they’re all but unstoppable in rainy and snowy conditions. 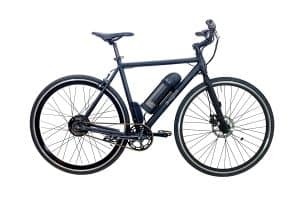 Other features of note include the 36V, 8AH ion lithium battery, 250-watt motor, front and rear disc brakes, and 21-speed Shimano transmission system. Like other Ancheer models, this E-bike is heavier than those offered by other brands. Thanks to the powerful motor, this is only a downside when loading or unloading the E-bike in your car for transport. All in all, the Ancheer Folding Electric Mountain Bike with 6-Spoke Wheels is a great choice for those that often ride in rainy or snowy off-road conditions. 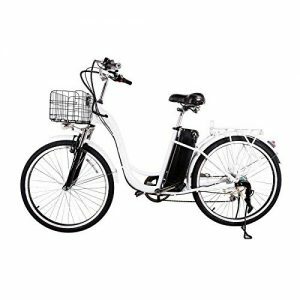 The Nakto Cargo Electric Bicycle is designed with smaller users in mind, such as young adults and women. The E-bike is designed from the ground up with comfort and ease of use in mind. An adjustable padded seat enables you to ride for longer. Other features include 6-level peddle assist, an LCD display on the handlebars, and a cargo basket on the front. A 36V, 10AH ion lithium battery, and 250-watt motor allow you to zoom around town with no problems. Unfortunately, the braking system leaves something to be desired. It’s not that they don’t work well, it’s just that we’d prefer front and rear disc brakes on an E-bike of this weight. The Nakto Cargo Electric Bicycle is comfortable, stylish, and makes a good choice for smaller riders interested in an E-bike for commuting or running errands. The Cyclamatic CX2 Electric Bicycle combines high performance with a smaller design that folds down even smaller for the utmost in portability. 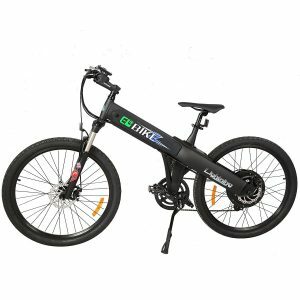 A 36V, 8.8AH ion lithium battery and 250-watt brushless motor give the E-bike a lot of “oomph” for trips around town. The bike tops out at 15mph and has a range of 25 to 31 miles depending on the weight of the user. Multiple operational modes allow you to pedal the bike yourself, have the motor take over completely, or get a little assistance while pedaling. There’s not much negative to say about this Cyclamatic E-bike. Perhaps the biggest disadvantage is that replacement parts, even those required by regular maintenance, are difficult to find. The Cyclamatic CX2 Electric Bike hits all the necessary marks. However, the area that it shines most brightly is in its portability. If you want an E-bike, you can load into the car with ease, this just might be it. Full-size electric bicycles take up a lot of space. Not everyone has the space to store one. 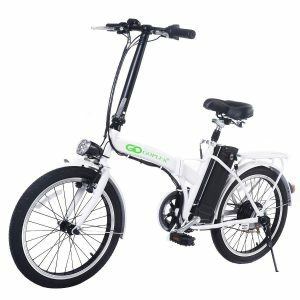 For those living in small apartments, the Goplus Folding Electric Bike is a great choice. The bike’s unique space-saving design is small to begin with. The 100% aluminum alloy frame means that it can be ridden hard nonetheless. Fold it down even smaller for even easier transport and storage. A 36V, 8AH ion lithium battery powers the 250-watt motor, resulting in a top speed of just over 20 mph as well as a battery life of just under 20 miles on a single charge. Keep in mind that this Goplus E-bike is for dry conditions only. Though rain won’t damage it, the tires tend to slip and slide in wet conditions, especially on wet leaves. The electric bike also isn’t the best choice for off-road riding. Those with limited space for storage should strongly consider the slim and foldable, yet high performing, Goplus Folding Electric Bike. According to a study in the International Journal of Behavioral Nutrition and Physical Activity, electric bikes can provide many of the same fitness benefits as traditional bicycles. 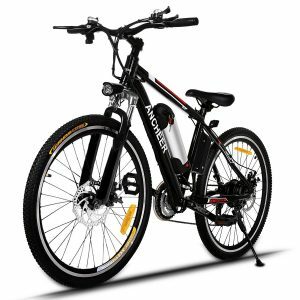 Those interested in an E-bike for exercise and fitness should strongly consider the powerful E-Go Electric Mountain Bike with 36V, 10AH ion lithium battery, and 250-watt motor. It’s one of the best E-bikes under $1000 designed with fitness in mind. In addition to the powerful motor/battery combo, it’s notable for its 9-level speed-assist and 7-speed Shimano transmission system. The downside to this model is the relatively lackluster customer service. Representatives at E-Go are notoriously difficult to contact if you have a problem with your E-bike. The E-Go Electric Mountain Bike is not only an excellent choice for those with fitness in mind, but it’s also one of the most stylish E-bikes on the market today. The E-Glide SS Electric Bicycle is one of the absolute best E-bikes for under $1,000. Indeed, for just a hair under $1,000, you get an electric bike with all the fixings of a model that costs twice that. At just 49 pounds, the SS sports a 6061-aluminum frame, a 36V, 10.6AH ion lithium battery, and a 250-watt rear-mounted gear-hub motor. A LED display on the handlebars displays a long list of stats including speed, time, trip time, odometer, trip distance, speed, and more. There are few downsides to this E-bike. Perhaps the only one, if we’re nitpicky about it, is that the bike isn’t as easy to adapt to as other models. The E-Glide SS Electric Bicycle is one of the highest performing models you can find for under $1,000. It’s a great choice for those that want something that feels similar to a standard bicycle. Cruising along the beach has never been better than with the Newport Beach Cruiser Electric Bicycle from X-Treme. 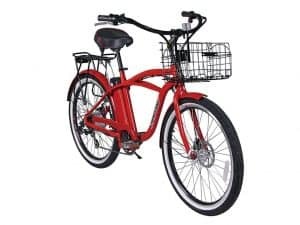 The bright red cruiser-style E-bike complete with a front cargo basket not only looks great, but it performs excellently as well. A 7-speed Shimano gear system is backed up with 24V battery and an impressive 300-watt motor. Balloon tires and front and rear disc brakes ensure safety during the ride. The main drawback to this E-bike is the required self-assembly. The instructions leave more than a little to be desired. 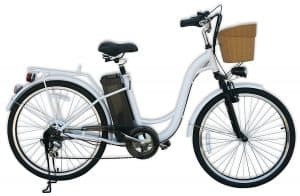 The X-Treme Newport Beach Cruiser is undoubtedly one of the best electric bicycles for leisurely cruises along the beach. Most E-bikes are unisex, meaning they can be ridden by both men and women as long as the sizing is spot on. However, the Yukon Trails Xplorer Electric Bike is designed specifically for women. That means a slightly smaller overall design with slightly smaller components. This Yukon Trails E-bike boasts a 36V, 10AH ion lithium battery, a 250-watt motor, and a 7-speed Shimano shifter. The bike is lightweight, durable, and easy to ride. The biggest con to the electric bike is the self-assembly. It comes in several pieces which you must assemble yourself. Though the Yukon Trails Xplorer Electric Bike can be ridden by anyone, men included, it’s designed with women in mind, especially regarding its sizing and dimensions. There are so many great E-bikes out there that narrowing down the options can seem daunting on your own. That’s what our reviews above are for – to help whittle down the options so you can select the best electric bike under 1000 for your needs and preferences. Better yet, not just some but all of these top E-bikes cost under $1,000 (some well under), so you can find a top-quality model at a steal of a price.